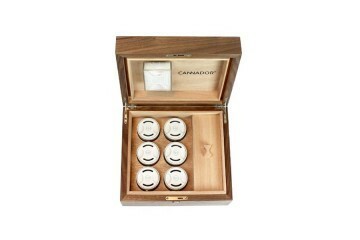 The 4-Strain Cannador® (with nook) is a great product for the strain conscious connoisseur who likes to keep smaller amounts of herbs separated and fresh with glass cups that contain adjustable ventilated lids. You can store up to 28.34g (or 26.70 ground) in this beautifully crafted humidor in either walnut or cherry. With a double-fitted rim, you can rest assured that no smell will leak. Each glass cup fits 7.08g (or up to 14.17g ground). The nook can fit your accouterments like a grinder or vape. 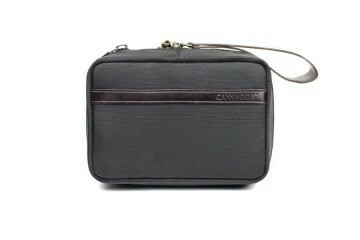 This comes with a lock and key, so you can keep your contents safe. Veneer exterior with solid wood mahogany interior. Cherry is a lighter more blonde color and walnut is darker brown. The finish is a clear matte to give a more natural look and feel to the wood. Each removable glass cup has an adjustable ventilated lid that slides open to allow for moist air from the humidity system to keep things fresh. The lids can be adjusted to be closed or opened to allow for humidified air to pass through. A wooden plate keeps these glass cups in place.